If years from now, behind-the-scenes reporting reveals that Radiation Blue—the team behind space survival sim, Genesis Alpha One—selected their game’s title by throwing darts at a spin wheel covered in sticky notes with sci-fi cliche words written on them, I will unquestioningly believe it. And I will wish that I could travel back in time to tell the devs to give the wheel another go-round. Genesis Alpha One is a bad name. It’s redundant. “Genesis,” “Alpha,” and “One” all mean the same thing. It’s like if Get Out was called, Abscond: The Exodus Escape. Or if Spider-Man 3 was called Spider-Man 3: The Bad One: This One’s Not So Good. We heard you the first time, folks. It’s making a word salad of only metaphorical lettuce and praying for Santa Fe zest. And, at first, it seems that Radiation Blue has applied the same philosophy to game design. Genesis Alpha One opens with a ship-building interface and asks you to place a few essentials on a barebones, black and Dijon yellow framework. When that’s done, the game switches to a first-person perspective, plopping you in the chrome-y corridors of the ship you just built. A few moments later, you’ll find out about the beauties of cloning, gardening and hunting for scrap metal—each with systems you’ll need to master if you want to survive. Then you’ll find out that you can climb into a smaller spaceship and travel to various planets where you’ll mine rocks for materials. And you’ll need to build reactors to power your ship. And you’ll need to build turrets and energy shields to fend off aliens. And, also, this game is a first-person shooter. And a rogue-like. And a survival game, complete with mining animations that take very obvious cues from No Man’s Sky. In the opening hours, as you play through the tutorial—working for the elegantly named Tutorial corporation—it seems like A LOT. Too much, honestly, like Radition Blue tried to make five or six very different games at once. It takes a decent time investment to begin to see how the seemingly disparate pieces fit together. But, like a Tractor Beam snapping into place alongside a Biotank, they do. Mining and hunting for scrap metal provide you with the materials you’ll need to expand your ship. Cloning provides you with extra labor to man the growing vessel. Gardening bolsters the biosphere with the necessary chemicals to sustain the expanding life on board. For a while, you’ll perform these actions in the dark. You’ll wait for the game’s end goal to reveal itself, expanding your ship, growing clones, without a clear idea of the purpose. But, eventually—for me it was a good five-to-ten hours into my playthrough, which is way too long—you’ll see a green sphere show up on the grid-based map that you use to chart your flights. This, you’ll be informed, is a potential Alpha One candidate—a viable planet where you can start a new life with your band of clones. The idea of finding the planet is introduced in the opening cutscene that plays before each run. It takes hours, however, for this North Star to appear in game. But, who would want to start a new life with these people? Genesis Alpha One succeeds at delivering the fantasy of living life in space. It has FPS combat with a speed and emphasis upon strafing that recalls (a slightly watered down version of) Doom 2016. It has space exploration. It has quick jaunts onto the surfaces of strange and alien planets. It impressively funnels all these seemingly unrelated actions through the sieve of the ship builder. But, while these actions are satisfying (in a grindy, Harvest Moon-ish way), and sometimes exciting (your pulse will almost certainly quicken the first time invaders board your ship), the inhabitants of your ship have no humanity. While, according to the narrative, your bunkmates are clones, they walk and talk like the most basic robots. Despite the game’s far future setting, these bundles of AI have a tin ear for conversation that make Alexa look like a David Mamet character. Each NPC is just a tutorial screen. You can’t ask them about anything personal. They exist only to explain your options. In other words, Mass Effect this is not. But, Genesis Alpha One is still a tense (if frequently grindy) genre blend. The mixture of shooter and ship-builder mechanics ensures that as you expand your ship, you’ll work to make an environment that you can effectively defend. 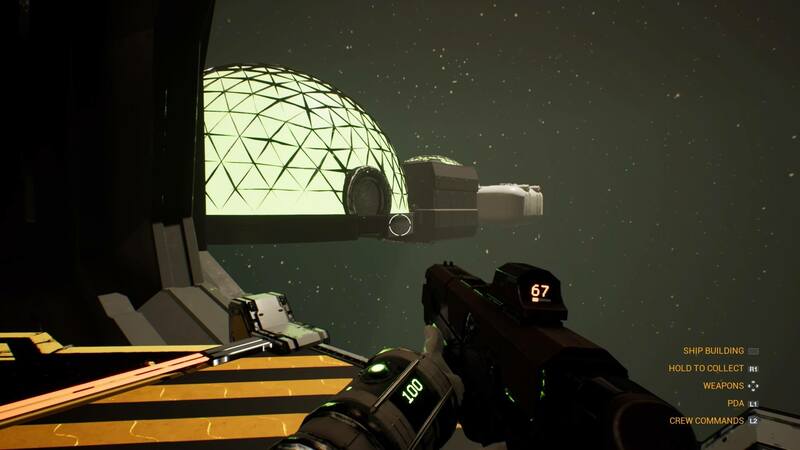 Malignant life forms use the tractor beam and the hangar to sneak onto the ship, so you’ll want to install turrets and energy barriers around these hot spots. If the aliens manage to escape and steal away to the guts of the ship, you could be dealing with an unrelenting onslaught later on. It’s a satisfying mix. This is the rare (only???) game offering something for fans of Doom, No Man’s Sky, Harvest Moon, and Fortnite. It’s not the perfect simulation of life in outer space, but, in some ways, it gets closer than anything else has. 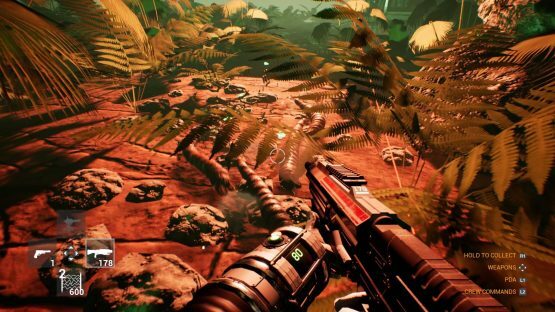 Genesis Alpha One review code provided by publisher. Version 1.01 reviewed on a Standard PS4. For more information on scoring please see our Review Policy here. Overall, a satisfying combination of genres. Looks pretty, on the spaceship and on planets. Fortifying your ship with turrets and energy shields is satisfying. It's A LOT to figure out at first. Crew members have no personality. Grindy gameplay gets boring at times.